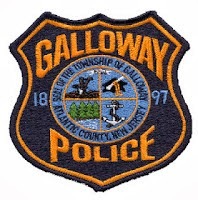 Galloway Township Police responded to 982 calls for service during May 25, 2014 through May 31, 2014. Additional statistics include: 1 Burglaries, 15 Motor Vehicle Accidents, 100 Tickets issued, 2 Driving While Intoxicated, 32 Arrests, 19 Domestic Violence, 13 Fire Calls, 93 EMS Calls and 0 Juvenile calls. On 5/25 Heather A. Mattle 38, of Galloway was arrested by Officer Paul Smith and charged with DWI. On 5/26 Bryan M. Oliphant 53, of Yeadon was arrested by K9 Officer Scott Winneberger and charged with DWI. On 5/26 Elizabeth R Thompson 23, of Galloway was arrested by K9 Officer Scott Winneberger and charged with possession of 50 gram or less of marijuana. On 5/27 Kimberly Cairnes 48, of Hamilton Township was arrested by Officer Kerry Baerman and charged with possession of hypodermic needles and paraphernalia. On 5/31 Rachelle Aime 21, of Galloway was arrested by Officer Dominic Fabrizio and charged with possession of drug paraphernalia. On 5/31 Richard Phum 18, of Galloway was arrested by Officer Steve Vernon and charged with shoplifting. On 5/31 Brittany Montalvo 23, of Egg Harbor Township was arrested by Officer Paul Smith and charged with possession of 50 grams or less of marijuana, possession of drug paraphernalia and cds in a motor vehicle.